Preheat the oven to 350°F. In an electric mixer on medium speed add the cake mix, oil, eggs and water and beat until combined. Line the cupcake pans with cupcake wrappers and fill 3/4 of the way full with batter. Transfer the frosting into a bowl and add the food coloring. Stir until your desired color is achieved. Then transfer the frosting into a piping bag with a large round tip and pipe the frosting onto the cupcakes. To garnish the cupcakes add a small piece of purple twizzlers to the top. Picking a theme or color is actually my first step when planning a party! After that, the other ideas begin to flow. It’s really easy. Start by choosing the details you want to use, then think of ways you can incorporate your party colors to match the theme of the party. For example, if I was going to have a purple party (similar to the one featured on the Martha Stewart show, so cute! 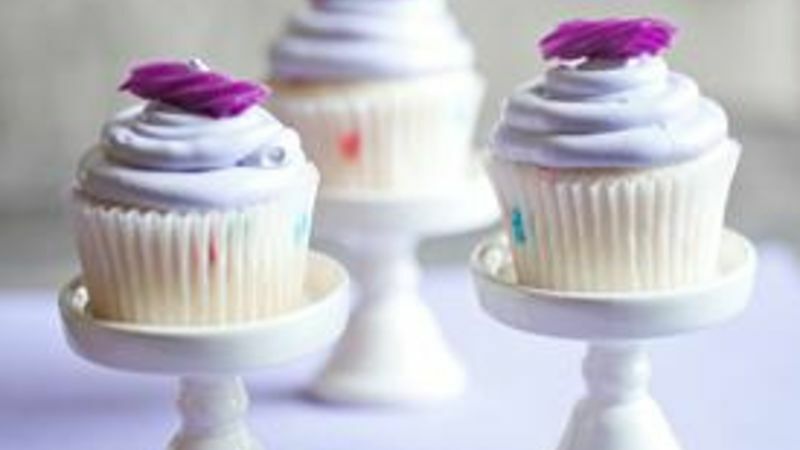 ), I would create purple desserts, like my Lavender Colored Cupcakes, just by adding food coloring. So easy! You can also buy items like cupcake wrappers, candy and cocktail napkins that match the party colors. If you want to serve Lavender Colored Lemonade, you can add a small amount of food coloring to that too and serve a purple drink! Garnishing the drink with licorice adds a nice touch and a yummy treat to the drink! By creating these little touches, you’re tying all of the details together making one perfectly planned party. Add a few drops of purple (or blue and red) food coloring into the white frosting. Whip together well, until desired color is achieved. Pipe the frosting onto the cupcakes and garnish with a small piece of purple licorice. Mmmm…. fresh-squeezed lemonade! Add a few drops of food coloring to the lemonade and stir. Serve with a piece of licorice. YUM!